Tek 9 | way above the level. Sentinel finally took the Sound fi Dead Clash! After their third appearance in the annual Sound fi Dead Clash, in St. Elizabeth, Jamaica, Sentinel finally took the trophy against Scorpio and Tek 9 yesterday night! Trooper, Black Kat and Body Guard was a No-Show! Curious about the fact that the jamaican sounds couldn’t didn’t show up (expect Scorpio). How that go? Hopefully the Promoter shed some light on that. From what I’ve heard it was a very deserved win and Sentinel really played outstanding. 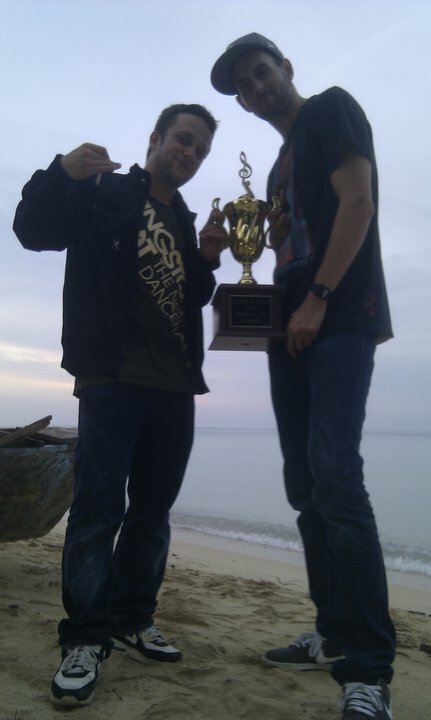 So big up Paul and Meska for winning another trophy for the german lugers shelf! On October, the 16th, the annual Sound Fi Dead Clash takes part for the seventh time in the Parish of St.Elizabeth in Jamaica. Sentinel Sound just released the Flyer and a Press-Text via their Facebook Site. Their Opponents will be Sound Trooper, Black Kat, Tek 9, Black Scorpio and Bodyguard! As promised, here are the Download Links to the Real Deal Returns Soundclash that was won by Sentinel a couple of weeks ago in Trinidad. 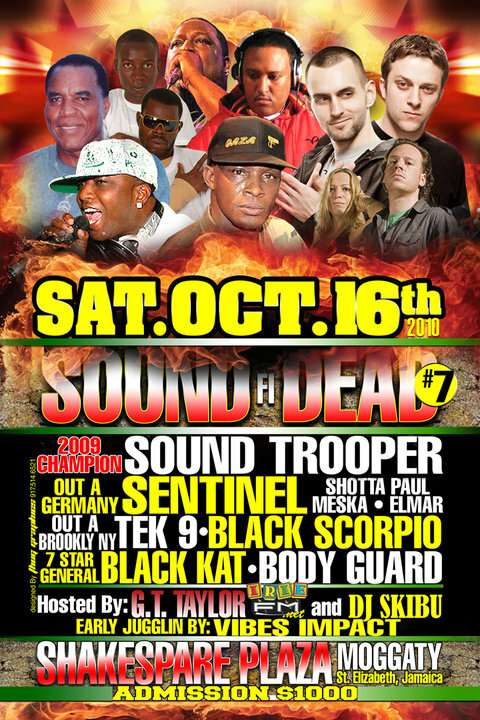 Last Night, according to Shotta Pauls Facebook Page, against Mr. Slaughters X-Caliber Sound and Tek 9 from New York. Congratulations to the German Lugar. Mad Sick! Finally, after nearly a year, the War inna East Clash DVD from 2009 is ready to download! After a constant string of unfortunate circumstances that were hindering the completion of this project, we at Herbalize-it can finally put the last nail in the coffin and announce that the War Ina East 2009 Europe vs USA – Gloves Off, Guns Out dvd is ready for release and can be now downloaded. Our deepest, sincerest apologies to all the soundsytems that took part in this clash (Team USA – Poison Dart & TEK-9 and Team EUROPE – SENTINEL & SUPERSONIC) and ofcourse all the die-hard curious clash fans all over the world, that have been anxiously awaiting the release of this dvd to re-live this amazing night in European clash history. Thank you all for your patience and continued support, never loosing faith or trust in the belief that we would indeed get this dvd completed and accessible to you, totally free of charge. Big up Sultan and the whole HERBALIZE- IT Family for making this possible! Finally the Audios for this years‘ Global Cup Clash are available via DHR. Check the Link to find the Download. Team Europe took the tophy after a long fight in the War inna East Clash yesterday night. Don’t feel like writing a rundown now, because I’m to tired still. But you can download the stream-ripped audios already and listen for yourself here (thanks to Volly & Rascal). Ojt, from the mighty Treva Massive Sound outta Trier recorded the whole thing with a Mic, standind in the crowd, also.